I completed this quilt ON New Year’s Day. So technically I have a finish for 2014. According to someone … other people … what you do on New Years will be what you do the rest of the year. So I guess this year is the year of the quilt finish. LOL. 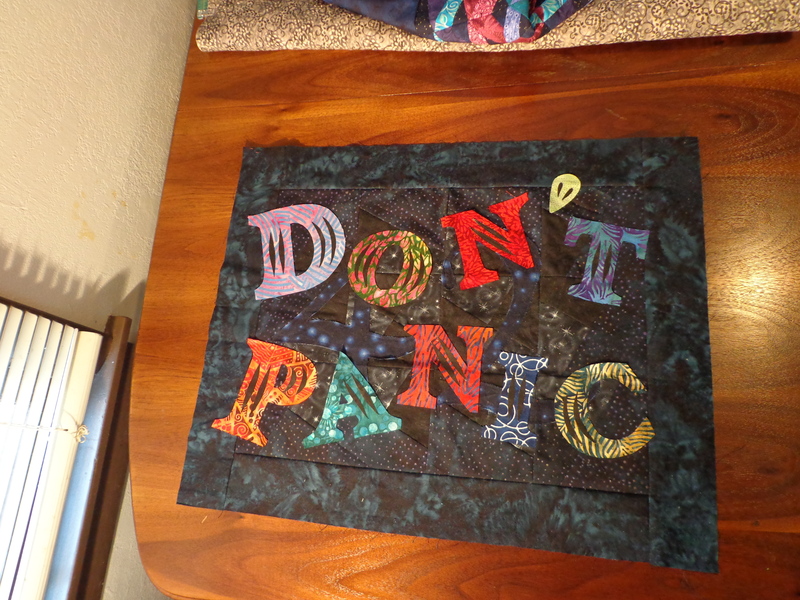 Well, you’ve already seen some of the in progress pictures for this quilt. Here’s the completed thing. And now you can see why it’s called Fans & Bows. 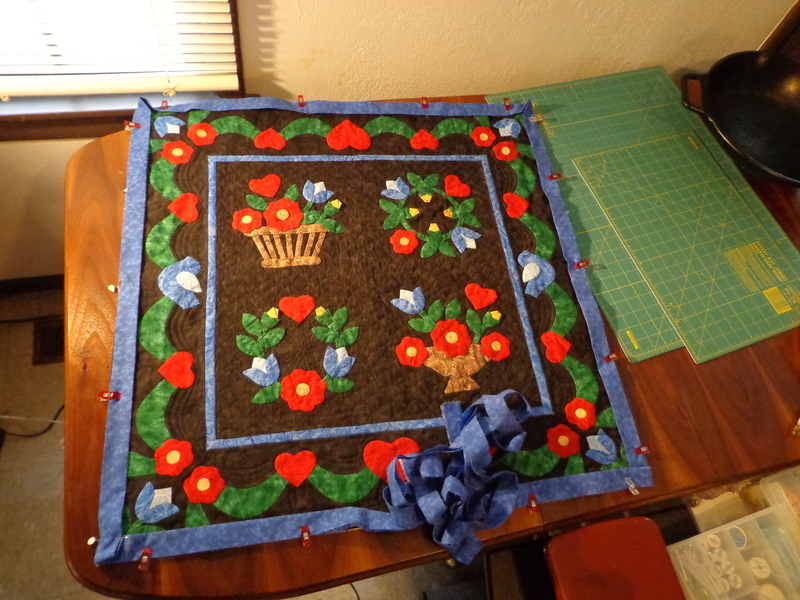 The red corners mimic bows, but I did hand tie some bows to go in the middle of the quilt at each border. The lace is really pretty, I stretched it to get around the corners and with the bow & lace embellishment, this will be more of a ‘look at me’ quilt than a “let’s sit under me” quilt. But that’s ok. The evolution of this quilt from the VERY start – March 15 2009, the second weekend of my quilting journey, I designed & pieced this top. And I saw all the white, and thought, cool – quilting space. But not yet. So the following National Quilting day 2010 I made up some fans I had in the back of the butterfly book I bought back then. Well the design was from a month earlier. Here are the fan pieces. And after I first stitched them down, this was my first fusible applique project. That I used a ‘decorative stitch’ to sew with my brother. All four fans changed the look of the quilt quite a bit. The next few months in 2010, I decided on the blank corners that now needed something. I spent some time making the back out of pieced fabrics. Strange, but I was excited about the back. This was Feb of 2011. And then I fused the quilt and set the whole thing aside. 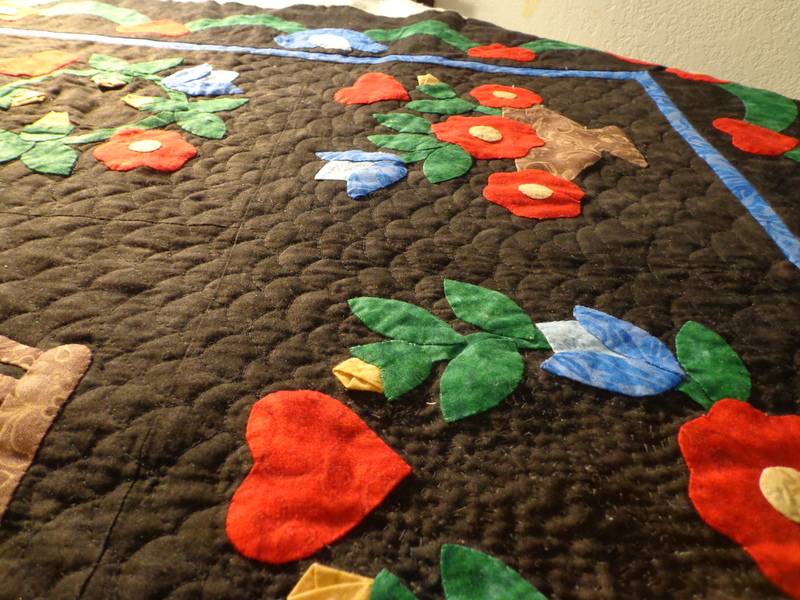 With the exception of finding some lace that I thought would compliment the quilt perfectly. Bought the lace in 2012, when going embellishment crazy for my periodic table quilt. 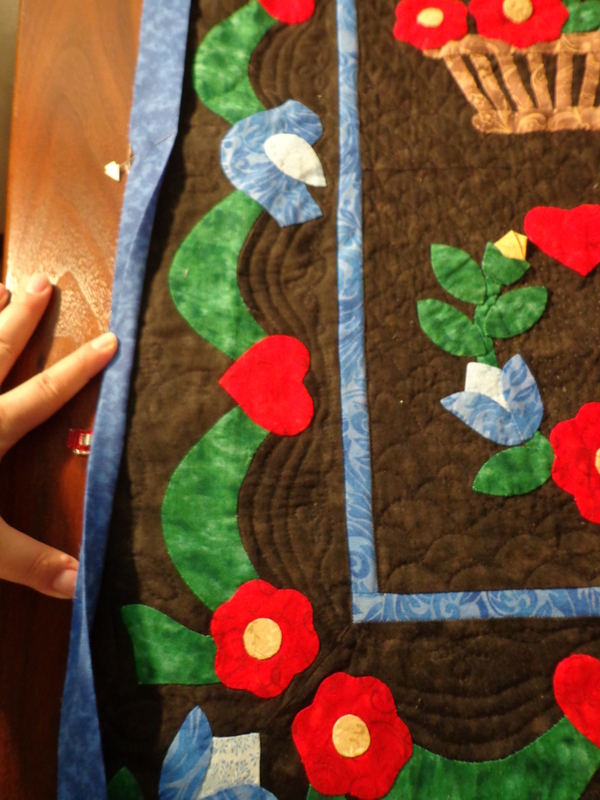 And once settling down on my cabinet machine Aquata, I decided to quilt her – finally. In early December of 2013. The momentum gathered by free motion quilting her, lead me to sew the lace once I had time. Another picture of the corners quilting pre-lace. And the back side of the quilt with the quilting and a few thread nests that I decided not to pick out. And the quilting showing up on the corner design on the back. And a few more quilting with lace pictures. center. Hope you enjoy. 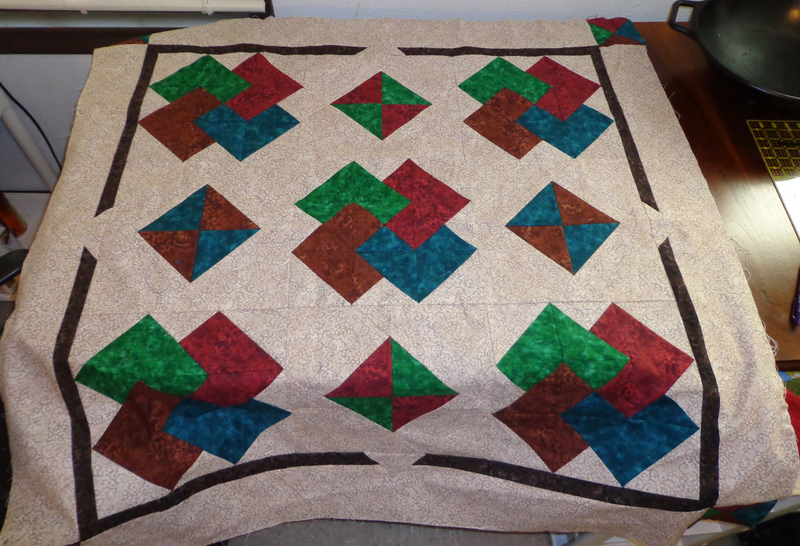 Most of the quilting was done with similar colors to the top, but not all. I know I could have done a steadier job if I had sketched out beforehand a little bit on the FMQ, but I was excited with how it was flowing. I was really glad to finally not do a pantograph or an overall design. Currently, I am thinking I need to work on custom work more, but when using the long arm, I don’t – because my time there is limited. I can’t believe how old of a UFO this quilt was, and I am so glad to get it finished! 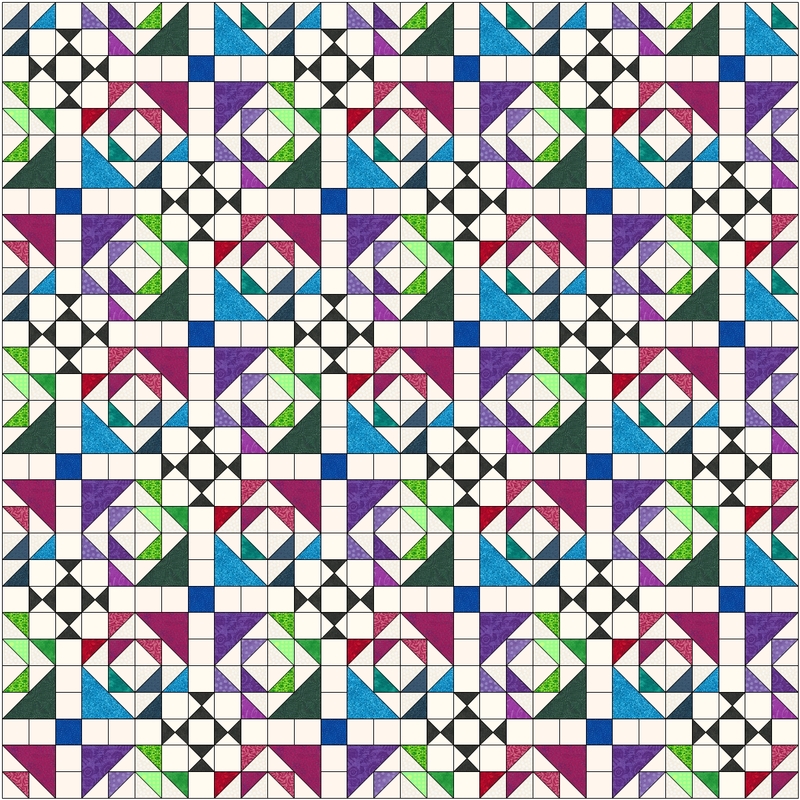 In my quest to make me crazy, I just had to look at two other completely different options for a quilt design for my Guild. 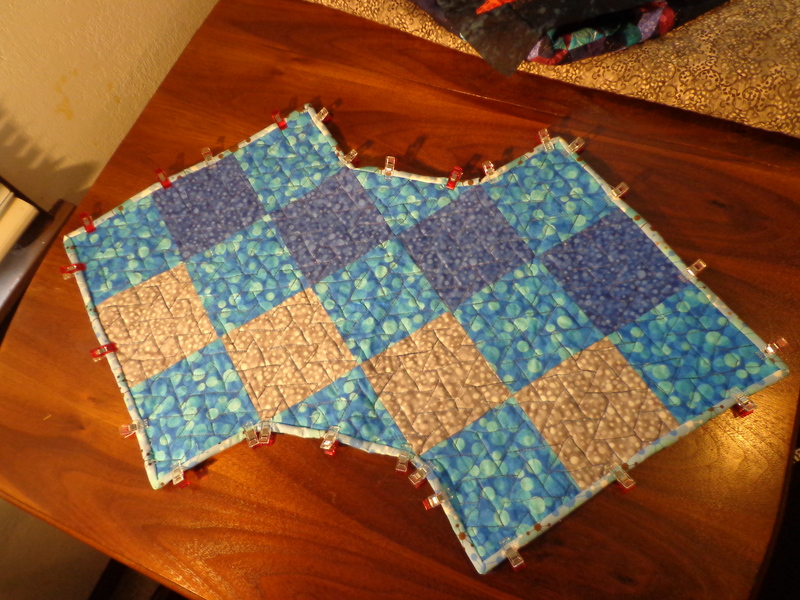 I agonized over the perfect alternate block for the footstool block to provide a choice for guild members to make. I came up with two choices, and asked you about it. And got some ideas which boil down to half and half or so. This gives the quilt an on point feeling. Good design. Seriously. But again, I’m stubborn. So then I have the whole different direction with another 5 x 5 grid block to match the 5 x 5 of the original block. This is using a grandmother’s choice block as the alternate block. Which I really like, this feels very Bonnie Hunterish scrappy to me. No weaving here, no flow in that sense, but look what happens when the blocks match, a cool secondary design. Now the block looks much more squared up to me. 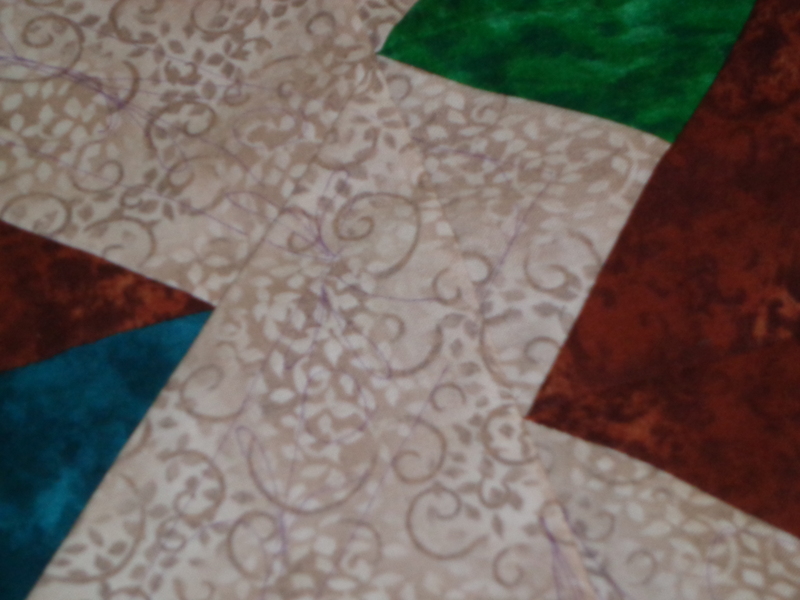 But I am trying one alteration to the grandmother’s choice block and see what works with it. 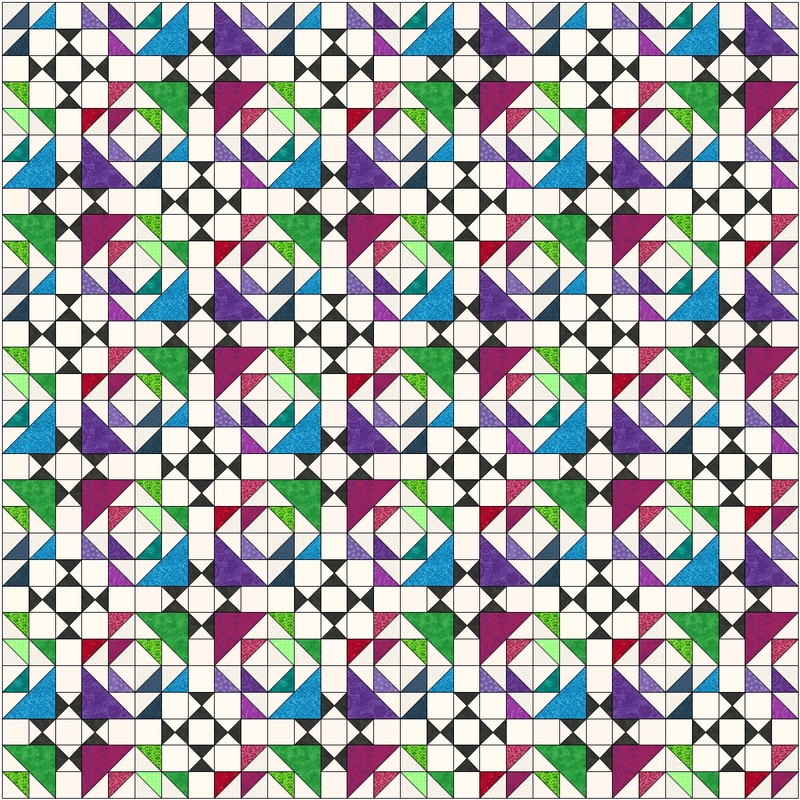 Which brings the black and the repetition of the quarter square triangles together and breaks up the ‘unintended sashing’ feeling of the last quilt. There are larger sections of color now and there is an emphasis on jewel tones. The quilt flows differently too, but I think the secondary pattern can tie this whole thing together. It helps to have two resources for 5 x 5 blocks but I have to admit, it’s not an extremely popular grid size to begin with. 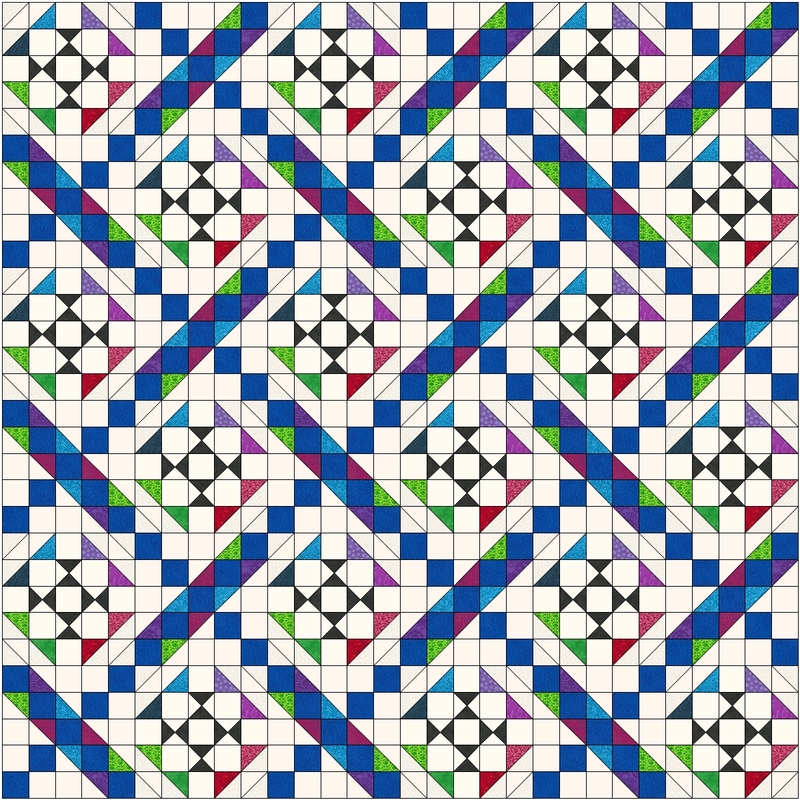 Hoping that sharing this with you helps you see what kinds of things people think about when looking to create quilting designs. Not that I’m an expert by any means, but it’s the thoughts that I go through.